This course will teach you how to effectively lead a successful team by establishing goals, roles, and guidelines that work. The success of a team links directly back to the team's understanding of company, team, and individual goals, and how they achieve their goals. 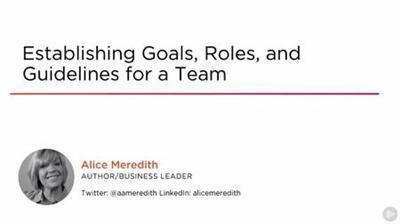 In this course, Establishing Goals, Roles, and Guidelines for a Team, you'll learn how to set strategic goals that are essential for any team. First, you'll learn how to set clear roles and responsibilities for team members. Next, you'll explore how to effectively support team goals. Finally, you'll discover how to align roles to ensure all team members work within allowable guidelines. When you're finished with this course, you'll be able to effectively lead a successful team.